Vice President Yemi Osinbajo addressing an audience in August 2018. The Muhammdu Buhari administration’s focus on uplifting the poor in society through its Social Investment Programmes (SIPs) is to ensure that more Nigerians are empowered to improve their lives and also contribute more to the nation’s economy, Vice President Yemi Osinbajo has said. Speaking at an event held at the Lagos Business School, Professor Osinbajo stated that the problems of the poor in society must be addressed to help economic growth. He highlighted the success of the government’s social investment policies as pointers to why economic models should also focus on uplifting the poor in society. “A lot of our ideas in our social investment policies are micro-credit loans to market women and petty traders and all of that are borrowed heavily from the Indian model,” the Vice President was quoted as saying in a statement by his media aide, Mr Laolu Akande. 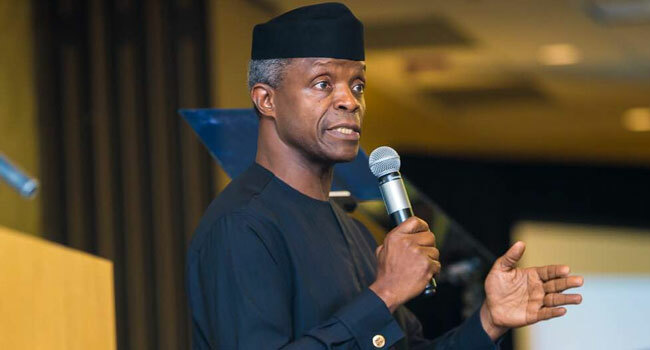 Osinbajo believes a vast majority of the people will be poor and consumer spending will remain low, no matter how fancy the economic policies are if the government fails to resolve the problem of the poor. He noted that the rule of law remains the most potent weapon for socio-economic revolution, stressing that the success of African economies and commerce depend largely on the enforcement of laws and regulations. The Vice President emphasised the importance for Africa to rethink and re-engineer its jurisprudence to achieve this. While pointing to a “threshold of the Africa century,” he described the continent as “clearly the last frontier for virgin economic opportunities”. Professor Osinbajo said, “Our enormous challenges range from how to provide opportunities for millions of young men and women, to extreme poverty, illiteracy and disease, to desertification resulting in famines and conflicts over land and water. The Vice President argued that commerce and economic development cannot thrive where the majority are desperately poor, illiterate and exposed to diseases all the time. He noted that the human development indices of a nation depend on the standard of living of its people, adding that law and administration of justice can change the bleak narratives on poverty. Find below the full speech by the Vice President at the event. First, let me say how very specially privileged I feel to be here to celebrate, first, the 90th Birthday of Papa, Chief Olu Akinkugbe, and also to be part of the very special celebration of the 5th anniversary of Olu Akinkugbe Business Law in Africa Fellowship Conference. I think we must first acknowledge that Chief Akinkugbe is the quintessential Nigerian business icon. For more than four decades, going on to five, he has occupied leading positions on the business landscape in Nigeria, inspiring generations of entrepreneurs and corporate executives. And there are strong parallels to be drawn between his business investments and this Fellowship. The Olu Akinkugbe Business Law in Africa Fellowship is, itself, an investment in knowledge and scholarship, in people, and in the future of Africa. And it is an investment that I believe is certain to yield tremendous benefits. As a businessman, Chief Akinkugbe has always had an international outlook. He has always been on the lookout for opportunities to connect Nigeria and other countries using the tools of trade and investment. It is, therefore, not surprising that even in his philanthropy, he is making African connections – a Fellowship in a South African University that goes to one academic from a Nigerian University and one academic from a University anywhere else on the continent. It is very much in line with his vision of using the fellowship to “enhance the ability of Africans to develop policies that will enrich the economic, social and moral progress of the African continent.” Here is citizen diplomacy at its best, an individual deploying his influence and experience to the strengthening of relations between countries. I think that we must all commend Chief Akinkugbe, and I personally also must commend him for endowing a fellowship in law, comparative law, and not in pharmacy where he has over the years become the doyen. It is, in my view, a mark of remarkable foresight and understanding of how things work. The phenomenon of inter-relatedness of things. And the concept of solving fundamental problems so that the problems that rest on them are more easily resolved. From the beginnings of orderly societies, it has become obvious that law is really the most potent weapon of socio-economic change or revolution. The success of our economies and commerce depend almost entirely on laws and regulations and their enforcement. If there is any moment in its history when Africa needs to rethink, reorder and re-engineer its jurisprudence, it is now. We stand today at the threshold of the Africa century. Africa is clearly the last frontier for virgin economic opportunities. It is also the continent whose success or failure would define human history in this century. And I do not overstate the point. Our enormous challenges ranging from how to provide opportunities for millions of young men and women, to extreme poverty, illiteracy and disease, to desertification resulting in famines and conflicts over land and water. All of these challenges clearly will define how the future of the world itself will shape up in the coming decades. Simply because Africa has the population and continues to increase in that population day by day. Besides, today our nations must contend with a plethora of governance issues, especially the corrosive effects of systemic corruption. In there also, is our capacity to negotiate trade and other agreements crucial for our economic development; especially in the context of free trade agreement. These challenges test our jurisprudence, our systems of administration of justice, because legal frameworks are fundamental to the solutions to these problems. I’ll just give two quick examples of how I believe The Olu Akinkugbe Business Law in Africa Fellowship can intervene in some of these issues. The first is in the challenge of building the capacity to enable African countries to better negotiate trade agreements. Whether, as individual countries or as an economic bloc, we are confronted with trade agreement, proposals, the WTO rounds, the Economic Partnership Agreements between the European Union and ourselves, between the Caribbean and Pacific Group of States etc. More recently, our own Continental Free trade agreements, which our keynote speaker has already dealt with very extensively and in detail. In all of these engagements, African countries usually lack the capacity and skills required to do the best deals. But a bad or disadvantageous trade agreement could mean disaster for local businesses. Our economic and business research institutions can offer us crucial guidance, and perhaps easily demonstrate to us where we already share common attributes or exhibit fundamental differences, prompting closer scrutiny or encouraging brisk concurrence, as may be appropriate. We need the capacity to undertake complex economic studies of diverse African situations and present alternative or comparative perspectives, which could form the basis for more confident negotiations. It is my respectful view that an essential part of the fellowship’s core or, perhaps you might say, its core mandate of advancing business law in Africa, must be to seek for us some balancing of the dynamics of our relationship with international financial agencies and multilaterals such as the World Bank and IMF, by ensuring the commonalities of the African perspective can be distilled and put forward. While it is often said that we need not reinvent the wheel, I am sure you will agree with me that we should not just adopt any model and play the guinea pig, unless a thorough study had been done of the local circumstances and peculiarities, as well as the effect such borrowed schemes, the effect that they may in on the local context. We deal practically every day, with the World Bank, with the IMF, and a lot of the multilateral financial institutions. But we’re always in some sense, at the short end, at a disadvantage position. And it’s because we have not truly worked out the true African perspectives on many of the trade agreements, the financial agreements that we entered. But I think that the fellowship offers an opportunity for us to distill some of these ideas that would help in negotiations, and help in agreements. The second issue I’d like to put to the fellowship is the challenge of poverty. Commerce and economic development cannot thrive where the majority are desperately poor, illiterate and exposed to diseases all the time. The country’s effective market, any country’s effective market, GDP, and human development indices depend on the standard of living of its people. The law and administration of justice can change the bleak narratives on poverty. So, for example, the pioneering jurisprudence of the Indian legal community on socio-economic rights has deeply affected their economy and lifted millions out of poverty. Indian courts have held, for example, that inherent in the right to life is the right to healthcare, food and even education. Thus, making free education and even a right to work in some senses, mandatory. It’s therefore not surprising that a lot of what the world knows and has learnt about fighting poverty, through micro-lending and social welfare schemes, has come from India. What’s even more remarkable is that their legal system has for decades assembled knowledge and thinking around these issues. Almost four decades ago, the Indian State of Maharashtra offered guaranteed employment to everyone seeking work and it was not necessarily the best work, but some work. A lot of our ideas in our social investment policies are micro-credit loans to market women and petty traders and all of that are borrowed heavily from the Indian model. A lot of the programmes that we are today working on, the conditional cash transfers, that we give to the poorest in society are based on many of these models. But these models are the products of a legal framework, they’re a product of a way of thinking about dissolving the problems of the poor. And we if we do not dissolve the problem of the poor, no matter how fancy our economic models or policies are, the vast majority of our people will be poor, consumer spending will be low, and generally speaking, our economies cannot be where they ought to be. Because the vast majority are so far behind. The issue, of course, is that law and our thinking about commercial law in Africa today, we must take the wider socio-economic context into account. Our commercial jurisprudence must now provide for the vast majority who operate under the shadows in the so-called informal market. Our distinguished Ladies and Gentlemen, I would like to again use this opportunity to express very special gratitude to Chief Akinkugbe for endowing this Fellowship. Here is a legacy that will stand the test of time. It is clear that Chief Akinkugbe has put into this Fellowship the same levels of dedication that have marked his business and investment life. But even more than this, no one can doubt that Chief Akinkugbe’s greatest contributions to Nigeria’s business landscape are a legacy of ethical conduct. Wealth that can be explained. A reputation built on over decades of hard work and trustworthiness, building block by building block. We are all extremely proud of you. As you may know sir, I am a man of faith, And I believe that even at 90 years old, there is still a lot to do. It was at 90 that Abraham, the father of faith, was given a fresh mandate by God (Genesis 17:1-2). When Abraham was 99 years old, the Lord appeared to Abraham and said to him, “I am Almighty God; walk before Me and be blameless. And I will make My covenant between Me and you, and will multiply you exceedingly.” You have no excuses sir, it is time for a fresh mandate. The almighty God will make you even more fruitful in old age. On behalf of the Federal Government of Nigeria, I wish you a happy birthday.